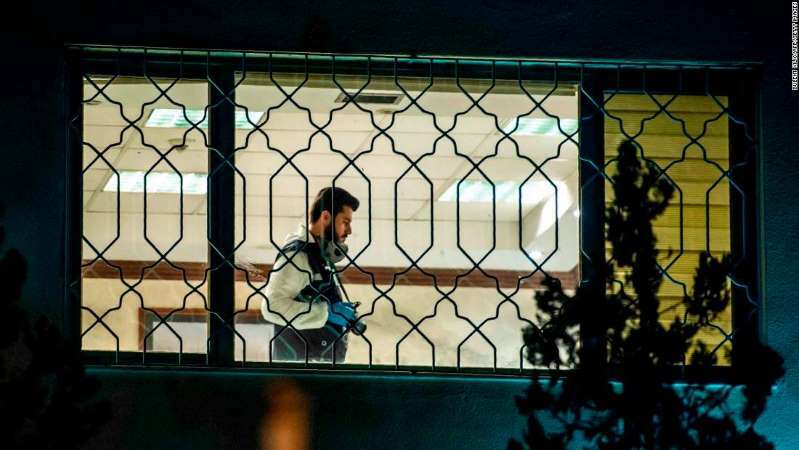 © BULENT KILIC/AFP/Getty Images A Turkish forensic police officer works in Saudi Arabia's consulate in Istanbul on October 15, 2018 during the investigation over missing Saudi journalist Jamal Khashoggi. The claim, which was first made to the New York Times earlier in the investigation into Khashoggi's fate, comes after Turkish officials searched the consulate for nine hours on Monday night. The Turkish official would not comment on the disposal method for the body. Turkish officials have said privately that Khashoggi was killed in the consulate on October 2 after he arrived to obtain papers that would have allowed him to marry his Turkish fiancée, Hatice Cengiz.Saudi Arabia has previously insisted he left the building alive, but Cengiz says she never saw him again. CNN saw a cleaning crew enter the main consulate building on Monday before Turkish officials, including a forensics team, arrived to begin their investigation. The semiofficial Anadolu news agency said Saudi's Istanbul Consul General, Mohammed Otaibi, left the country on Tuesday. Saudi Arabia has been under intense international pressure to explain Khashoggi's apparent death, which has created a diplomatic rift between Saudi Arabia and the West. US President Donald Trump dispatched US Secretary of State Mike Pompeo to Saudi Arabia on Tuesday as sources told CNN that the Kingdom was preparing to acknowledge that Khashoggi died at the consulate in Istanbul as a result of an interrogation that went wrong. The sources said the interrogation was intended to lead to his enforced return to Saudi Arabia.